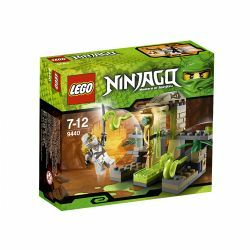 9440 Venomari Shrine is a Ninjago set released in late November 2011. It includes Zane in ZX form with a silver katana, a snake shrine, the Venomari Snake Staff and a launching feature to shoot new snake pieces at intruding ninja. It includes new moulds for the snakes and a new type of brick that resembles an actual ceramic brick. This is a description taken from LEGO.com. Please do not modify it. (visit this item's product page) Battle for the golden Venomari staff at the Venomari Shrine! Launch the snakes for a surprise attack! Avoid the toxic slime and seize the staff! This is the only set in the first wave 2012 sets to contain the Venomari Staff. The included shrine is the largest shrine to hold a staff. Facts about "9440 Venomari Shrine"